Please note: This product is a serial download and not a boxed version. 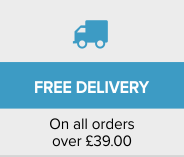 Once your order has been placed, you will be emailed shortly after with a download key to access your software. 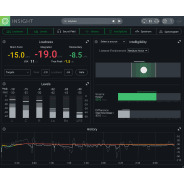 iZotope has announced Insight – a comprehensive metering suite designed for post production and broadcast applications. 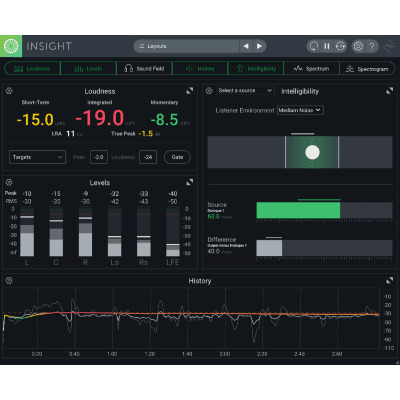 Insight provides a full suite of audio analysis and metering tools, perfect for visualising changes made during mixing and mastering, troubleshooting problematic mixes, and ensuring compliance with broadcast loudness standards. Fully customisable and scalable, Insight allows you to visually monitor all relevant information from your stereo or surround mix in a convenient floating window. 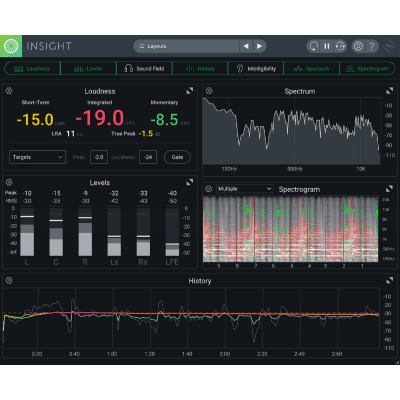 With level meters, loudness meters, a spectrogram, spectrum analyzer, vectorscope, surround scope, and a loudness history graph, Insight allows you to keep an eye as well as an ear on your mix at all times. Immediately detect potential mix problems through real-time visual monitoring and color-coded alerts. 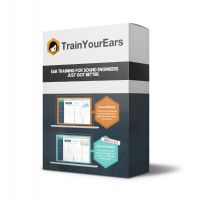 Ensure your audio is fully compliant with current loudness standards with forward-thinking tools that adhere to standards like BS.1770-1/2/3. Perform deep and flexible analysis with zoomable meters and the ability to route audio from any tracks or buses to Insight. Design your ideal metering plug-in by choosing the meters you want to view, customizing them, and resizing the Insight window to fit your current workflow. Get an extensive suite of metering tools in a single plug-in, including true-peak level meters, loudness meters, loudness history graph, stereo vectorscope, surround meter, 2D/3D spectrogram, and spectrum analyzer. Inspect, understand, and react with Insight. 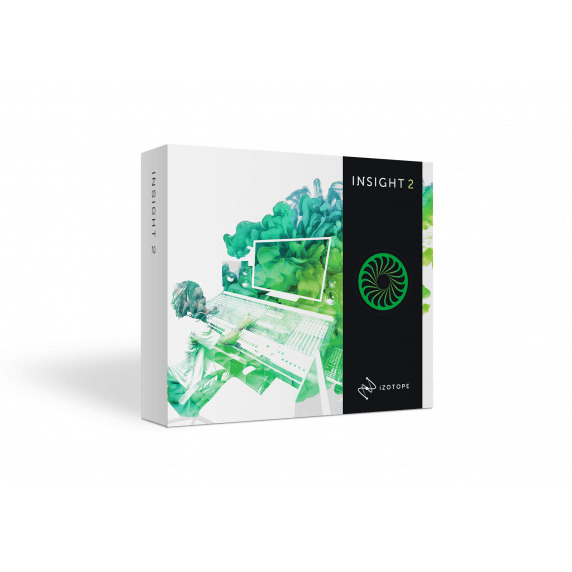 Insight visually guides you throughout the mixing process, empowering you to look deeper into your audio with intelligent analysis tools and real-time monitoring capabilities. 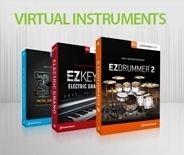 View tried and tested analog-style meters with innovative digital twists. 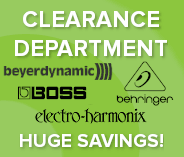 Keep tabs on cutting-edge displays that give you limitless access to your audio. Design your ideal metering plug-in with customizable views, settings, and presets. With Insight, the eyes have it all. Spectrogram: View a detailed topographical map of your audio stream in 3D or 2D, and feed in any individual tracks or buses via Meter Taps. Unfamiliar with a spectrogram? Watch our video to learn more. Spectrum Analyzer: Study the spectral content of your audio in real-time, with display options like Linear, Octave, Critical Band and more. 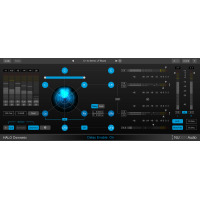 Levels: Monitor both True Peak and Loudness meters for immediate feedback on your project´s levels. 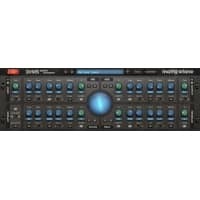 Fully compliant with BS.1770-1/2/3, Insight includes meters for immediate loudness calculation and True Peak detection, loudness calculation over time, and faster than real-time offline loudness calculation. Plot an infinite history of the loudness of your mix with the Loudness History Graph: use it for retrospective examination of your mix´s loudness, or for real-time monitoring of loudness trends as they occur over time. 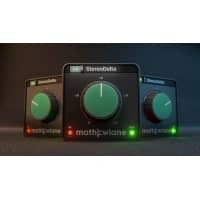 Size the plug-in to optimize your studio screen space and choose the meters appropriate to your workflow. You can then adjust each partition´s size to best suit your preferences. Load one of Insight´s 30+ presets, each designed for a different common workflow, or save your own most-used meter settings for easy recall. Take total control over how your audio is visualized: each meter provides numerous display options. Perform deep analysis with easy freezing, zooming and hovering within relevant meters for closer inspection, exploration, and data pinpointing. 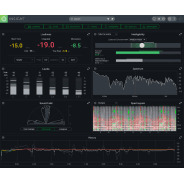 Monitor your audio for compliance with recently passed loudness standards—like the CALM Act—with Loudness Meters and the Loudness History Graph. Ensure your audio won´t clip in the analog domain with Insight´s True Peak meters, fully compliant with the recently released BS.1770-3 technical specification. Easily visualize both the stereo and surround sound field of your mix to ensure a successful downmix. Assess how dialog and/or voiceover levels are balanced alongside your project´s music and effects by routing tracks or buses to the Spectrogram via Meter Taps. Make insightful mixing decisions and tweaks by routing your mix´s tracks and buses to the Spectrogram via Meter Taps. Compare the loudness of multiple tracks on a record, or compare your track with a reference track, to see how your master matches up. Choose the sound effect or atmosphere with the right spectral properties for your mix—analyze how it will fit into your project by using the Spectrogram or the Spectrum Analyze. By evaluating audio levels in terms of how the human ear perceives loudness, loudness meters are used to ensure a mix complies with broadcast regulations, like those specified by the Advanced Television Standards Committee and European Broadcasting Union. Fully compliant with the ITU-R BS.1770-1, ITU-R BS.1770-2, ITU-R BS.1770-3, and EBU R128 standards, Insight provides the tools you need to be confident that your audio meets regulations. See important values at a glance with Loudness Meter Readouts that show Momentary, Momentary Max, Short-term, Integrated, and Loudness Range calculations, as defined by BS.1770 metering guidelines. Retrospectively analyze the loudness of a mix, or monitor loudness trends as they occur, with the Loudness History Graph. Quickly assess if current or past audio projects are in compliance by running an Offline Loudness Calculation, which is faster than real-time in hosts offering offline processing. Prove adherence to loudness standards to clients, networks, broadcasters, and legislation enforcers: document and archive a project´s loudness data with an exportable log or graph. 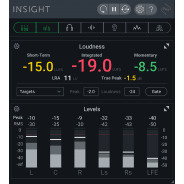 Quickly configure Insight to reflect the loudness settings in your region with Insight´s Loudness Presets. 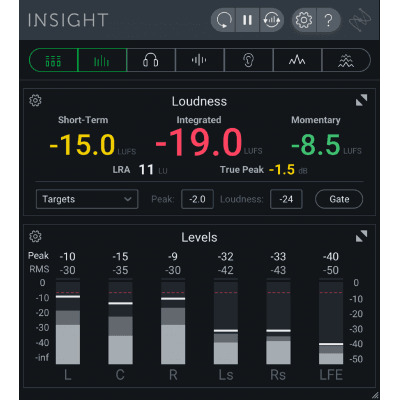 Insight´s innovative Surround Scope helps you visualize how your surround project will be spatially perceived by your audience during playback, and also keeps you aware of any potential technical problems with your audio´s alignment. Display up to 6 channels of surround data in Film, SMPTE/ITU, and DTS channel configurations. Quickly deduce how a surround mix will be perceived in the surround space with a uniquely stylized, 360 degree Surround Amplitude Meter. Be instantly aware of any potential phase issues with Sound Correlation Alerts, which indicate when there´s a chance of signal cancelation during summing or playback. 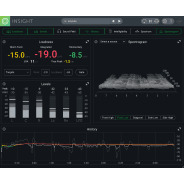 Unlike typical "waterfall" plots, Insight´s unique real-time 3D spectrogram creates a detailed topographical map of audio using iZotope´s high-resolution spectrogram capabilities. Rest easy: Insight takes advantage of video card graphics processing for full-screen 3-dimensional metering, preserving more processing power for your audio work. For eye-popping visual insight, feed information on multiple audio streams to the Spectrogram via Meter Taps. Add Meter Tap plug-ins to individual tracks or buses, then open the Spectrogram to see how mix elements combine in rich detail...all in real-time. Insight´s resizable Stereo Vectorscope provides useful display options for examining the stereo image of your mix. Insight also includes a real-time spectrum analyzer for examining the frequency balance of your mix. Display one of 4 different types of spectrums: Linear, Octave, 1/3 Octave and Critical Bands. Click and zoom by both time and frequency, or hover to pinpoint exact Hertz/decibel values. Adjust advanced controlsto customize how the analyzer appears and how frequently it updates. 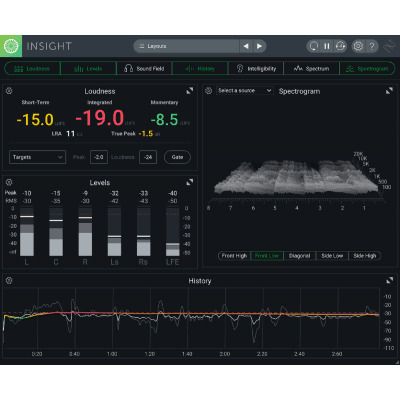 With a wealth of options for personalizing your metering experience, Insight lets you visualize your audio in a way that´s perfect for any project or session. Make the most of your screen real estate: keep Insight compact when space is limited, or maximize it to full screen when you´re free to see more. Pick and choose which meters you want visible, then adjust each partition´s size to your preference. Perform deeper analysis with flexible zooming, scrolling, scaling, and freezing of meter data. Try out common metering views with 30+ Insight presets, and choose metering options based on the loudness standards in your region. Compatible with both 32-bit and 64-bit hosts, like Pro Tools 7.4+, Avid Media Composer, Nuendo, Cubase, WaveLab, Logic, EDIUS Pro 6.5, Final Cut Pro X, Audition, Premiere Pro (Surround only), SONAR, REAPER, Digital Performer, Sound Forge Pro, Vegas Pro, and many more.